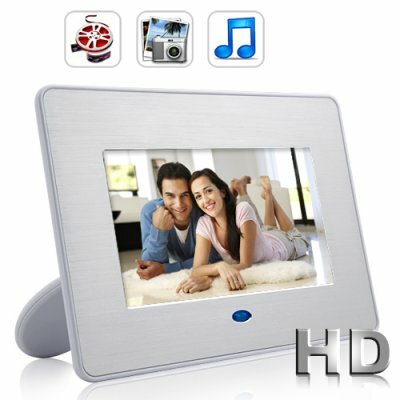 Successfully Added Mirage - 7 Inch Digital Media Photo Frame + Remote Control to your Shopping Cart. Those beautiful photos: magnificent mountains, winding rivers, marvelous view from the sky, intimate moments with beloved ones, in retrospect, look like mirage to you. But you’ve been there and done that. Now it’s time to show those precious moments and remind yourself that life is beautiful. The Mirage, a 7 inch digital photo frame with remote control is for you to share those memories with friends, families and, additionally, watch movies or listen to music conveniently. Besides showing photos clearly at 800x480 resolution, this electronic picture frame supports and plays multimedia content using its built-in media player, including your favorite digital AVI and MP3 files. With sound output provided by two high quality built-in stereo speakers, you can enjoy listening to your tunes directly from the on-board speakers, or you can also choose to use your favorite earphones/headphone to watch movies in tranquility without any outside noise interference. This great digital photo frame is now in stock for single or bulk purchase. Click "Add to Cart", and we will express ship you straight away. Brought to you at a wholesale price from the leaders in consumer wholesale electronics - Chinavasion. No, it comes with a standard AC power adapter and plugs into a standard wall socket. The number of photos this Digital Photo Frame can hold depends both on the size of the memory card you insert in the Photo Frame as well as on the size of the image files themselves. This model can support memory cards up to 4GB. That's a lot of photos! You can adjust the rate to every 5, 10, 15, or 30 seconds. You can also display only one picture at a time in Static Mode.